Cut the Birds is awesome. Not the game itself, mind you. Just the premise. I mean, it's not often you see a cheap knock-off go after not one game, but two. In case you haven't worked it out by the subtle title, Cut the Birds (maybe they even stole the name...from Crecente) is Angry Birds meets Fruit Ninja. Quite literally. 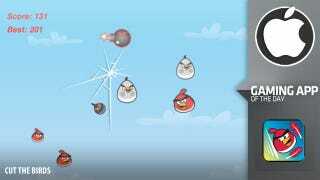 The bad guys featured in the game, which are flying at the screen and which must be sliced with your finger, are lifted straight out of Angry Birds. Even the game's icon features Rovio's famous red bird. The slicing and structure of the game, meanwhile, is all Fruit Ninja, meaning anyone who's played that - and I imagine that's most of you - will know exactly what to do here. What I like about Cut the Birds, aside from the balls it took to submit the game for approval (and how it once again that it serves to highlight Apple's farcical approvals process), is that it's actually pretty good! The game is smooth and responsive, and unlicensed or not, there's something cathartic about repeatedly cutting those damn birds in the face over and over and over again. If you feel like playing the latest fake Louis Vuitton handbag of the App Store, you can get Cut the Birds at the link below. At least, you can until it's removed.